This is what Selena Gomez looked like at her very first AMA appearance 7 years ago! You have to see Selena Gomez’s very first AMAs appearance back in 2009! From then until now it’s wild how much the former Disney darling has changed, but our love for Gomez’s fashion is still as strong as it was way back when. Sunday marked the 2016 American Music Awards and the 24-year-old singer made her first red carpet debut since revealing she had lupus related depression this summer and of course she looked flawless. Gomez’s fabulous fashion statement — she rocked a bright red gown — got us thinking about what she wore to her first AMAs. So, what did she wear to her 2009 AMAs debut you ask? Well, it had a LOT of sparkle and it was pretty fabulous. When Gomez hit the red carpet back in November 2009, she wore a stunning, short, silver frock that was so '00s it hurts — complete with matching silver clutch and black strappy heels. The entire dress was like looking at a giant disco ball thanks to the silver sequins that covered it from top to bottom. Plus, Gomez rocked a short ‘do, which helped to keep all eyes on the shiny ensemble. The “Same Old Love” singer posed with her then-BFF, Demi Lovato, inside the award show and couldn’t have looked any cuter. These two were so freaking adorable during their Disney days, don't you think? Plus, their hair color matched with its dark black hue, which we love. So, what did Gomez wear to this year’s award show? Well, it had no glitz at all, and instead looked like something out of a fairytale and screamed sophistication! 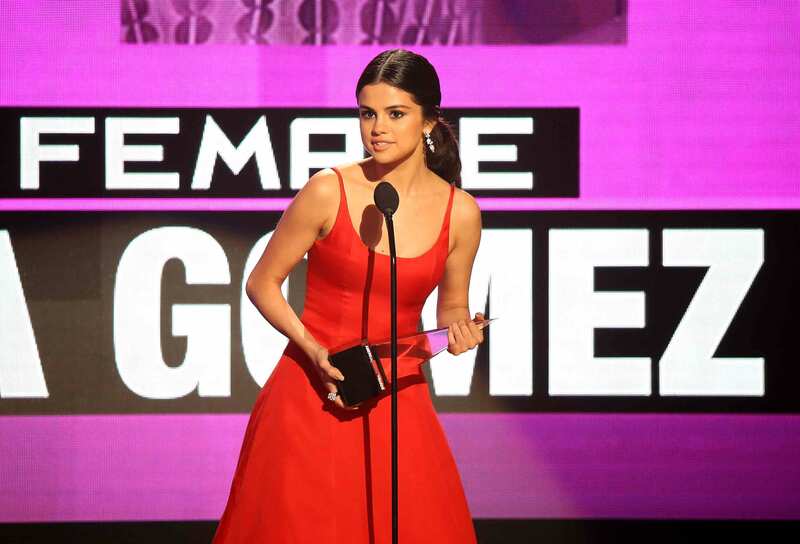 The Hotel Transylvania 3 actress gave a heartbreaking and touching speech at the 2016 AMAs, which was just as beautiful as Gomez's outer beauty at the event. We especially loved her red dress choice and natural makeup used to compliment it. Now for the then vs. now photos — in case you thought we’d forgotten about them! Back in 2009, Gomez donned a short, crimped hairstyle, which was sassy and fun, while in 2016 she showed her maturity and modern style, by slicking back her hair into a low, soft ponytail. The one thing that hasn't changed however, is Gomez's signature pose of blowing a kiss to the cameras and her fans. It's alive and well! Whether it’s 2009 or 2016, we just love Gomez. She is just the cutest!